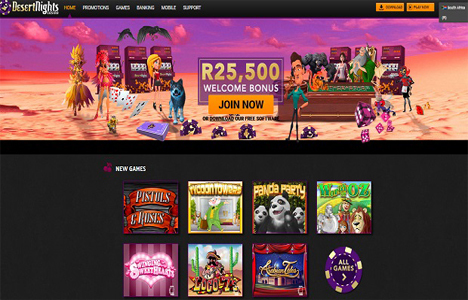 Desert Nights Casino is a vibrant addition to the Rand market of online entertainment. The casino uses Rival software and is operated and run by DeckMedia (a well trusted and recommend group). As with all the casinos listed on Slots-Online.co.za, we only work with casinos who we have personally met and the DeckMedia group is no exception. The play options available are the well trusted online download version, no download and the fabulous Mobile choice. From a games perspective you can get all the best Slots, I-Slots, Table Games, Jackpots, Video Poker and some Specialty Games. It’s always nice to be able to deposit, play and win all in your own local currency. So, Desert Nights Casino makes it easy for you to make "South African Rands" the currency of choice. New players are given a very generous and warm welcome. How much warmer would you feel when you know there is up to R25,000 in deposit bonuses, plus an extra R500 no-deposit bonus as an added reward! It’s the perfect start to a long and beneficial relationship, especially if you are a regular player looking to have some timeout to relax and enjoy yourself. You are guaranteed "hours of entertainment" on some of the most appealing slots online. Desert Nights provides the warm welcome you’ve been looking for! As a new player you can enjoy up to R25,000 in deposit bonuses, plus an extra R500 no-deposit bonus as an added reward! This is the perfect bonus for players looking to enjoy hours of entertainment on some of the most appealing slots online. R100 FREE Sign Up Bonus! Desert Nights Casino is operated and owned by the DeckMedia group and the games are driven by the well acclaimed Rival software. The casino offers a variety of play options ranging from Online – No Download, Download and Mobile. – Apple IOS – iPad Air, 4th Generation iPad, 3rd Generation iPad, iPad 2, iPad mini Retina display, iPad mini, iPhone 6, iPhone 6+, iPhone 5S, iPhone 5, iPhone 4S, iPhone 4, 5th Generation iPod touch. – Android – All Android 4.0 + tablets and phones with a minimum of Chrome 31.0 browser. Many other devices, including the latest Blackberry devices, will also run the mobile games. One of the reasons why Desert Nights Casino is so popular is their variety of games on offer. These games range from the ever popular i-Slots to regular Slots, Table Games, Progressive Jackpots, Video Poker and of course the Specialty Games. As with all online Bonuses, make sure you understand the playthough requirements.